I mentioned that I had thought of a really good gift for Mr. P's birthday this year. OK, I didn't actually buy the whole boat. I bought a few hours worth of the boat. 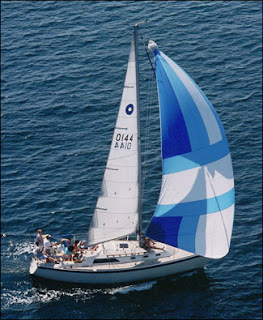 I chartered it for a private sail in Newport, Rhode Island, a short trip from our hotel in Boston. It was wonderful! He very much enjoyed it. And now I want one. For our very own. See how we're heeling over? (I've already mastered the lingo.) It looks like the water is about to enter the boat, but it doesn't. Hey sailor! Pass me a Summer Ale, please. Um, does that BIG yacht know to move out of my way, or am I going to have to spin this thing like I'm playing Wheel of FortunePleaseDon'tLetMeDieAtSeaIHaveChildrenToRaise!?! The boats with colored flags are former America's Cup winners. We met a sweet furry resident named Milo. This next house (yes, that whole thing is one house) was built by the people who brought Worcestershire sauce to America. There are about a dozen chimneys and each is shaped differently, each being the shape of a different type of Worcestershire sauce bottle neck. I thought that was very clever and lighthearted of the super rich sauce people. More heeling. You dizzy? Have more beer. This lighthouse is a Bed and Breakfast on a little island. They ferry you out there and leave you. And you have to actually work the lighthouse while you're there. Happy Birthday (again) P. I love you! **Sigh** I love being on the water. We sold our boat last year and we miss it. A Lot. (not a sail boat, but still). I really want to make it to that coast sometime soon. It looks beautiful! You know that if you get the sailboat, next thing you are going to want is one of those charming little "cottages." Oooo, that looks amazing! My husband was an avid sailor in college, but we don't have a boat (yet), so I may just have to copy your awesome gift idea some time. How wonderful! My husband wants to buy a "fishing" boat. A 40 ft tournament fishing boat!! Maybe he could just rent one!! How sweet of you, I'm sure he loved it! Looks like you had a great time too! Hey princess! THAT looks amazing and you look simply devine. You should totally get all over that and I will come visit! Lovely pictures! What a great birthday you provided for him. And those saucy people, full of Worchestshire...have quite the rooftop of chimneys! What an awesome gift!!!! You go mama! I love sailing and haven't been in years! What an awesome b-day gift. Wasn't Newport awesome? Did you have some chowdah at the Black Pearl? WAY< WAY< WAY ALL THE WAY COOOOLLLL!!!! You win the completely way too cool wife of the year award. Gorgeous pictures! That looks like an amazing time! I am so jealous! What great photos -- it looks so beautiful! Thanks for sharing. Now, do you know the correct way to pronounce Worcestershire? Hehe! Love it! My sister and her husband lived in Newport for a year while he was at the War College getting his masters. Sounds fancy, huh? Anyway, we got to visit and it was amazing. Absolutely gorgeous. Oh, looks like y'all had so much fun! That was a great gift. Here's the thing about those mansions..in theory they seem like fun - but, once we spent a weekend with some rich friends in their 'mansion' (not quite as big as these - but still!) and I felt like I spent the whole 2 days trying to find everyone. I was wondering around trying to locate this child or this husband the whole time. We were so glad to be back in our small, cozy home. ohh, newport is one of my favorite places on earth!! Oh WOW. Nothing can top that gift. Okay, maybe something - but WOW. And Newport of all places? Amazing. It is my dream to sail. But my birthplace looks very pretty! Ohmygosh! What a wonderful birthday gift for P. Beautiful. That looks like a great trip! I love New England. Those houses are something out of a movie!